O.B. Dahle, one of the first residents of Daleyville (named for Dahle), established a postal pick up and distribution site at his store. A private service went to Blue Mounds once a week to pick up the mail. In 1857 the federal government created a mail route to the area and named Anaun Sanderson as the first Perry Postmaster and the post office was at his farm near the corner of County Z and Spring Creek Rd. From 1871 - 1895 O.B. Dahle became the postmaster and the post office was moved to the "new" Dahle Store. In about 1895 - 1905 Ellen Goli ran the post office in the old Dahle house across the street from the store. Inman Iverson and Teddy Grinder bought the store in about 1905. In 1910 the post office was moved back to the store until about 1914 when it closed. From Wisconsin Post Office Handbook, revised edition No. 3, Frank Moertl, 1999, this post office closed in 1902. 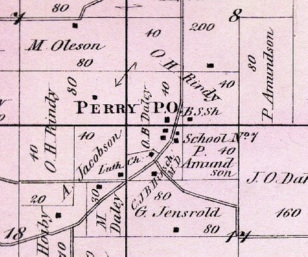 The Blue Book of Wisconsin shows Perry Post Office as a rural post office of the Mt. Horeb Post Office from 1903 to 1931.